Rickshaws were first seen in India around 1900 AD and have gained significant popularity since then. Today, cycle-rickshaws form an integral mode of transport in our cities and can be seen plying in almost each and every city in India. They have become a preferred mode of travel in our cities, especially for shorter distances. It works on pedal power and can carry upto two passengers at a time. Cycle rickshaws not only serve as an affordable means of travel but also have various other environmental benefits related to its use. Its compact and flexible design allows it to comfortably pass through narrow lanes where generally other public transport modes find it difficult to reach. With advent in technologies, a step has been taken to promote this already existing sustainable mode of transportation – 'cycle rickshaws'. Ecocabs were, therefore, conceptualized and introduced so as to strengthen the existing unorganized network of cycle rickshaws and to promote it as an affordable means of sustainable urban transport especially for shorter distances. An attempt has been made to improvise the various aspects of the entire cycle rickshaw industry including accessibility issues, quality of service, welfare of associated traction men, rickshaw itself and the society at large. 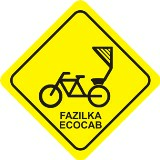 An "Ecocab" is basically a dial-a- rickshaw service developed on similar lines as a dial-a-cab service. The main idea was to bridge the gap between demand and supply through equal distribution of fleet and automation using latest IT tools and real time technologies. The concept was first time launched in the world at Fazilka, a small town in the state of Punjab near India Pakistan Border.